The planet Pahvo has been a flashpoint of late, particularly after a recent trans-dimensional temporal event. Forces from the year 2256 (and two universes) have found their way to Pahvo through spatial aftershocks, and are hell-bent on conquering the enigmatic world. In Peril Over Pahvo, a new Featured Task Force Operation, five Alliance captains will deal with the invasion events in the Pahvo system. Temporally and dimensionally displaced fleets are closing in as Alliance forces scramble to implement planetary defense systems to safeguard the planet. Until those systems are in place, it’s up to a small group of ships to defend Pahvo from attack. This event will last for 3 weeks starting in March for PC players, and on Xbox One and PlayStation 4 in the spring of 2019. All players level 10 and above will be able to participate, and can earn a TFO Commendation once every 20 hours. Complete the TFO on 14 different days to earn the Terran Guerilla Combat Armor in addition to marks, dilithium, and three Featured TFO Reward Boxes. This box gives your choice of an Enhanced Universal Tech Upgrade or a Captain Specialization Point Box, which gives the character who opens it a Specialization Point. These boxes are account bound and may be traded via the account bank. The Terran Guerilla Combat Armor may be equipped on any character or bridge officer, providing superior protection in ground combat scenarios. In addition to its built-in protection, this armor also may be activated to provide a special temporary delay to incoming power, converting all received damage into damage-over-time effects for several seconds, allowing crucial extra moments to react to incoming fire before it becomes deadly. Obtaining the Terran Guerilla Combat Armor also provides a costume unlock accessible via the Tailor, to wear the Terran Guerilla Vest and Jacket as seen worn by Gabriel Lorca on screen. Don yourself with this menacing Mirror Universe garb and strike fear into your foes! Any character who finishes the 14 day project will unlock a bonus project that can be completed with a single TFO Commendation. 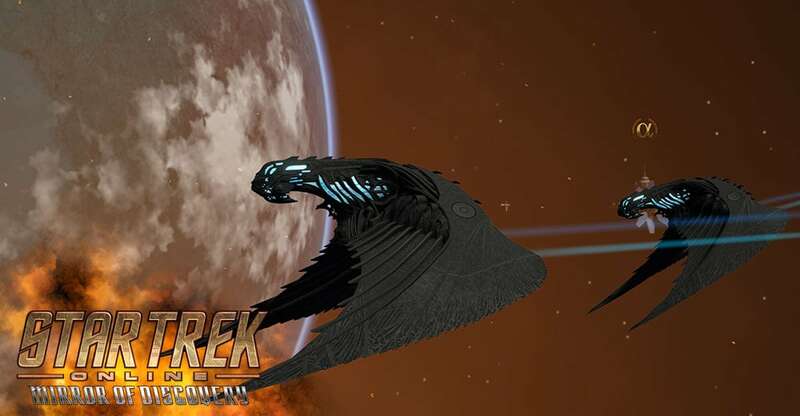 This project will reward dilithium ore, fleet marks, and a mark choice package. In addition, we'll be rolling out some changes to enemy difficulty with this new update. We've heard your feedback on high level battles, and after a lot of internal testing, we're going to be making our first changes to that difficulty to hopefully make those big fights a little more tenable. You'll notice enemies at levels 55 and above will be hitting a little less hard - not so much less to make it easy, though. You'll still need all of your tactics to make it through those big fights.